“It’s the best processor we’ve ever done,” said Intel's Kirk Skaugen. Move over, Broadwell: this is what the PC industry wants you to buy. Intel’s Skylake CPUs aspire to nothing less than a complete overhaul of the PC, from performance to connectivity, security, and more. 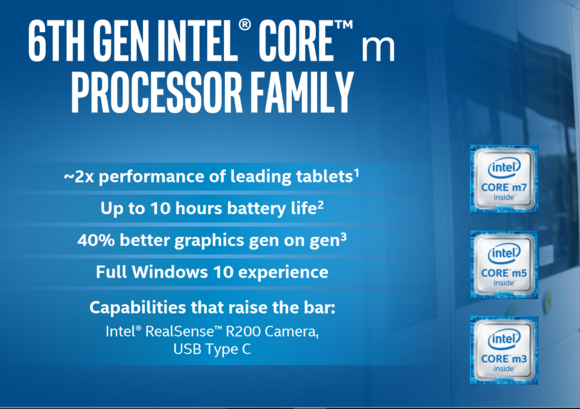 After rushing through its Broadwell generation, however, Intel’s been more careful in introducing its new flagship. It started with just a few gaming PCs at Gamescon. Intel meted out a few more key details at its Intel Developer Forum in August. As of Wednesday at IFA in Berlin, we have a nearly complete picture: its speeds, feeds, and prices, as well as much more about the internal design—and the hopes and dreams riding on this new family of chips. It's a big family, too. By our count, Intel’s announcing 48 new Skylake sixth-generation Core chips this week at IFA: the Core Y-series chips for tablets, U-series chips for thin-and-light notebooks, and the H-series chips for “ultimate mobile” and performance mobile workstations, while the S-series chips will be included in both performance and value desktops, all-in-ones, and mini PCs. In an unexpected twist, Intel will also apply its good-better-best branding to its Core M lineup (along with a confusing naming switch to a lowercase 'm'). If you’re building a desktop PC, be aware that the new Skylake chips use a new LGA 1151 socket, meaning that you won’t be able to use your existing motherboard. Like Windows 10, this is just the beginning of an ongoing launch. Throughout the fourth quarter and into 2016, Intel plans to launch vPro versions of the Core i5, Core i7, m5, and m7 chips; plus more Pentium and Celeron versions. Intel will also launch a Xeon-branded version of Skylake for servers. Why this matters: The PC market continues to shrink, and Windows 10 isn't helping—its free Windows upgrade is letting a lot of consumers hold onto their older PCs. With Skylake, Intel is bringing a host of new features that will give new generations of PCs something to brag about. Whether those innovations will spur much-needed sales remains to be seen. Intel is really selling the notion that it’s time to upgrade that old, outdated PC. “It’s the best processor we’ve ever done,” said Kirk Skaugen, senior vice president and general manager of the Client Computing Group at Intel. But the company knows Skylake needs to be more than a simple CPU if it means to reinvigorate the PC. A decent chunk of Intel’s Skylake vision concerns its related PC technologies: things like wire-free charging and display; TrueKey security, and its RealSense cameras. Intel executives said the PC industry is on the cusp of an important change, driven by Skylake. Over 300 different PC designs are expected over the next several quarters, all based on the sixth-generation Core technology. The new PCs' features should lure users away from their older systems—at least, that's the plan. “There’s over a billion PCs that are more than three years old now. They’re slow to wake, they don’t have much battery life, and they can’t compete with all these new experiences,“ Skaugen said of the Skylake PC generation. Intel designs chips on a “tick-tock” basis: first migrating an existing design to a new process technology, then designing a new chip from the ground up. 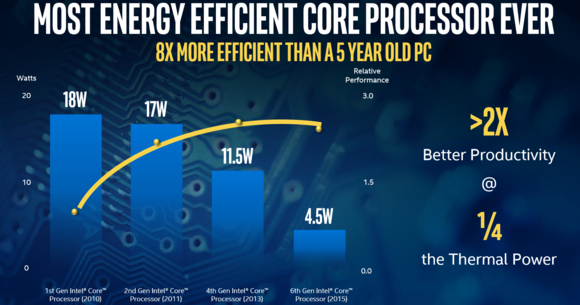 The 14-nm Skylake chips use the same process as Broadwell, but scale from a tiny 4.5 watts for the Core m to 91 watts for the most powerful Core i7s. Intel claims that the Skylake mobile chips are up to 60 percent faster than the mobile Haswell chips launched in Jan. 2014, yet they consume 60 percent less power, and outperform those chips by 40 percent in graphics. Intel is disclosing some of the details of the Skylake architecture, though not the transistor count. “The overall challenge of the design was to have the scalability as well as the improvements,” according to Shlomit Weiss, the vice president of the Platform Engineering Group at Intel. Those requirements were met with a mixture of consternation and innovation alike from the engineers Weiss manages, with some claiming it was impossible. "We proved them wrong,” she said during a briefing with reporters. How did Intel succeed? Through an emphasis on cutting out power through design alone, Weiss said. Each little improvement adds up: adding a digital PLL for “major” power savings across the whole of the chip; increasing speed with a lower minimum voltage; and doubling the number of manageable power domains. With Skylake, PC makers are now able to set their own constraints, too: throttling a CPU if a notebook detects that the underside is too hot, or giving a burst of power when needed. 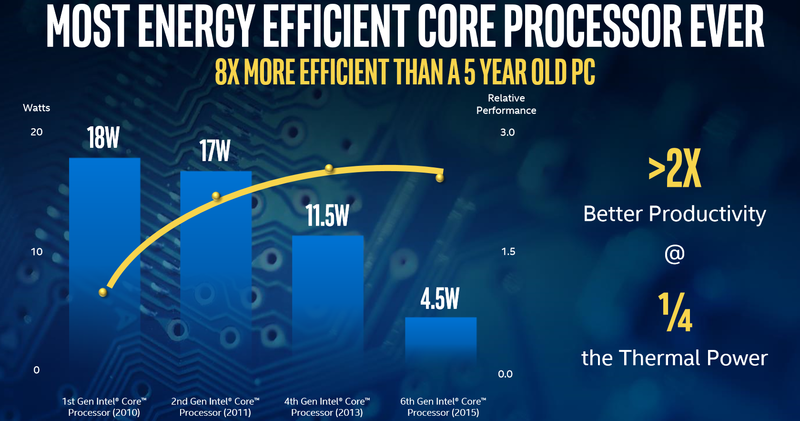 Probably the most interesting power-saving technology in Skylake is something called Speed Shift. Previous generations of Intel chips used the Windows operating systems as a power manager, letting it decide whether it needed to be in an active or low-power state. With Speed Shift, Skylake manages itself. Skylake now takes just a single millisecond to drop into a low-power state, rather than the 30 ms it previously required. The snappy responsiveness lets the PC switch faster from a a low-power state to full performance and back again, Weiss said. 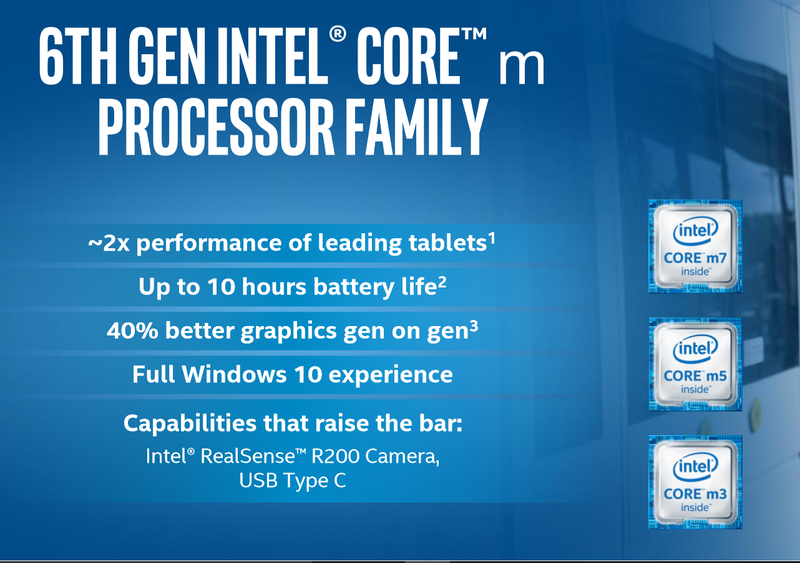 Intel is positioning the Skylake Core M as the engine of the two-in-one PC. The lowest-power offerings in Intel’s Skylake lineup are the Core M chips, now rebranded, inexplicably, as the Core m. These will be the foundation of so-called two-in-one devices, consuming just 4.5 watts. With Skylake, they’ll be a bit easier to distinguish, carrying the “good, better, best” branding of the Core i3, i5, and i7. In the first quarter of 2016, Intel will even build its next version of its Compute Stick around one. That’s not to say that the Skylake mobile chips are anemic, power-sipping processors. In fact, Intel has two mobile chips designed for power users: a new Xeon “server” processor, designed for true mobile workstations, and the Core i7-6820HK, an overclockable mobile processor. At IDF, Intel executives said we’d be seeing laptops with an easy-peasy, one-touch overclocking mode by way of a ’turbo’ button. Let’s see when and if they happen. Skylake also includes a step up in the graphics department, pairing the Intel HD Graphics 515, 520, and 530 cores with their respective processors: the Y-Series, the U-Series, and the H-Series chips. Intel is claiming that Skylake’s graphics performance could be up to 40 percent faster than Broadwell measured via the Sky Diver benchmark, though that’s based on a comparison between the Intel Graphics HD 5300 core found in the prior Broadwell based Core M-5Y71, and the Intel HD Graphics 515 core built into the Skylake Core m-6Y75. Intel is also using the same two chips as a basis for saying the HD Graphics 500 series will improve 4K content creation up to 20 percent faster and ensure 10 hours of battery life when playing back full HD video. Intel is making aggressive claims about the quality of the graphics core inside the new Skylake chips, though reading the fine print reveals they’re a bit overblown. All of the 5-series graphics cores will support a display across three 4K monitors, a substantial increase in graphics horsepower. Intel also made substantial improvements in ultra low power 4K video playback and related scaler and conversion engines, Intel’s Shenoy said. In the future, Intel plans to add a version of its higher-performance Iris Graphics technology to some of its lower-power mobile offerings, together with most likely either a 32MB or 64MB dedicated eDRAM frame buffer. Although they won’t offer the performance of a new GPU card, you’ll still see a graphics boost. As with the majority of Intel’s “tock” processor redesigns, Intel has paired a new LGA 1151 socket with the new Z170 chipset, and mainstream support for DDR4 memory. While older DDR3 memory modules are supported, they’re specifically low-voltage DDR3L modules, implying they’ll be reserved for specialty low-power applications. In other words, while you might be able to jury-rig a build of an older hard drive and graphics card, your motherboard, CPU, and memory will have to be repurchased. 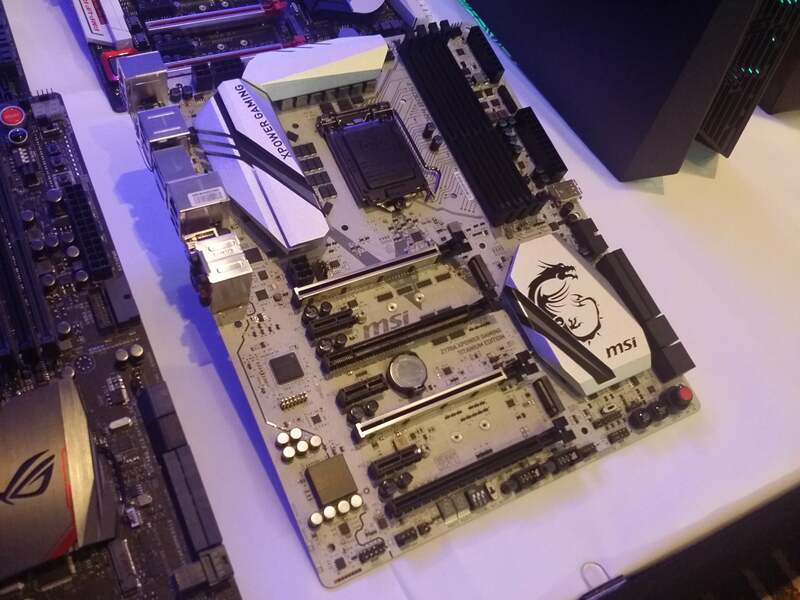 A MSI Z170A XPower Gaming Titanium Edition motherboard, one of several that will support the new Skylake chips. Naturally, Intel—as well as the PC industry—has absolutely no problem with that. Over the last five years, PCs powered by Intel chips have performed 2.5 times faster, with a thirtyfold increase in graphics and a threefold improvement in battery life, Skaugen said. “The most beautiful and powerful systems are coming to market now, and our belief is that there’s never been a more exciting time to buy a PC,” Skaugen said. Even though Intel is formally launching the Skylake chips today, we already know what sort of performance the chip brings, via reviews of the Core i7-6600K and Core i7-6700K. PCWorld’s Gordon Mah Ung already dove deep into the guts of the Z170 chipset, its 20 PCIe Gen 3 lanes, and the corresponding DMI 3.0. As Ung notes, the upshot is that you can run your graphics card at full bandwidth while still having a super-fast PCIe or M.2 SSD, or multiple SATA SSDs along with your your 10Gbps USB 3.1 devices, without sacrificing performance, as you would with older chipsets. Intel’s Skylake CPU offers maybe 5 to 10 percent more performance than a Haswell CPU that runs at higher clock speeds, and it’s noticeably faster in graphics workloads as well. But if you want to, you can push it further: According to Gregory Bryant, Intel’s corporate vice president and general manager of desktop platforms, the 4.0-GHz i7-6700K is as “stable as a rock” when overclocked to 4.7 GHz. With just performance as a selling point, it might be hard to justify an investment in Skylake. 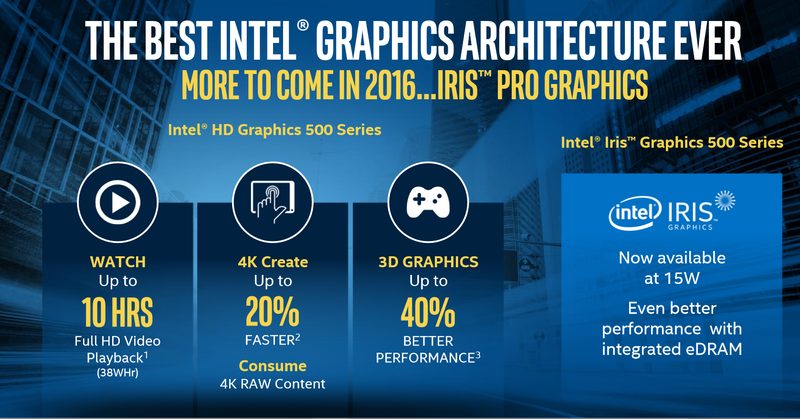 That’s why Intel surrounded the chip with a whole host of platform improvements. WiDi and Thunderbolt and True Key, oh my! Intel’s vision of a “wire-free PC” dates back several years. Intel’s vision is that your power cord will be replaced by a Rezence wireless charging mat, your display cable by WiDi or WiGig, and your ethernet cable by wireless networking. With Skylake, only the former is missing. Intel showed off wireless charging at its IDF conference, but the technology still needs to be built into thousands of coffee bars, desks, and even tray tables to make it successful. If it’s currently being built into Skylake-based laptops, Intel isn’t saying. Some of the PC-level improvements Intel and its partners are building around the Skylake chips. Some of these technologies you should be familiar with: Thunderbolt 3.0, the 40Gbps connector that integrates into the USB-C physical form factor and provides charging, to boot; Wireless Display (WiDi), along with the upcoming managed WiDi Pro; WiGig, similar to WiDi but for your desk; and what Intel calls Intel Unite, a simple videoconferencing application that taps into the power of Intel’s chips. Most users are also familiar with Intel’s RealSense cameras, which are being built into laptops as the foundation of Windows Hello. Intel hasn’t made much of it, but it also has a service called True Key, which steps in for Microsoft Passport. Windows Hello and Microsoft Passport were designed to go hand-in-hand; you’d log into your PC via facial recognition, and Passport would tell other Web sites, hey this is you! So far, however, Passport has been lost at sea. True Key works similarly to Hello in that it, too, recognizes your face. But True Key is a password manager: It uses your face as a master password, then sends a complex password to up to 15 sites to log you in. It’s possibly a bit less secure and more expensive than Passport, but it’s also ready to go, right now. Software Guard is an Intel technology designed to protect against buffer overflow attacks and other attacks on the system. Instead of trying to discover and eradicate malware, however, Software Guard isolates “islands” within the chip where known good code resides. 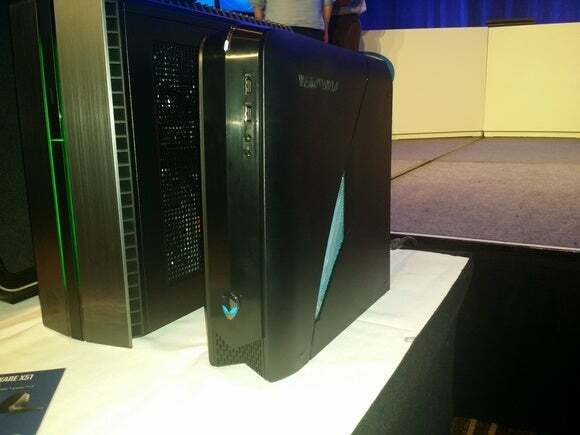 The Alienware X51, one of the sixth-generation Core or Skylake systems on display. Intel is showing a number of Skylake systems at IFA, from manufacturers including Acer, Asus, Toshiba, Dell, Lenovo, Alienware, and MSI. All of these vendors are making their own announcements at IFA about a veritable flood of PCs coming for the holidays. Unfortunately, the industry is giving you a mixed message: on one hand, Microsoft is saying that just about anyone can upgrade to and run Windows 10 on their existing PCs, all for free. Intel and the hardware makers, however, believe that you’re best off plonking down some additional cash for a real PC, built on Skylake. Pop quiz, consumers: What will you do?